PINK ELEPHANT IS THE WORLD’S ITIL® 4RUNNER! Pink Elephant once again leads the way in ITIL certification! Choose the world’s ITIL 4runner for your ITIL 4 certification. When it comes to ITIL and IT Service Management, Pink continues to stand out – after 25 years and 4 versions of ITIL, we’re still the one everyone looks to first. Over the years, NO OTHER organisation has been as deeply entrenched and influential in ITIL as Pink. Having played many major and key roles in the development of ITIL over the years and now the new ITIL 4 Foundation certification course, we’re extremely passionate and excited about the new release! Look no further than Pink Elephant for your ITIL 4 training and certification. This Foundation level course is the first course to be introduced by AXELOS in the new ITIL 4 certification scheme. The Foundation course is a mandatory requirement for all other levels. 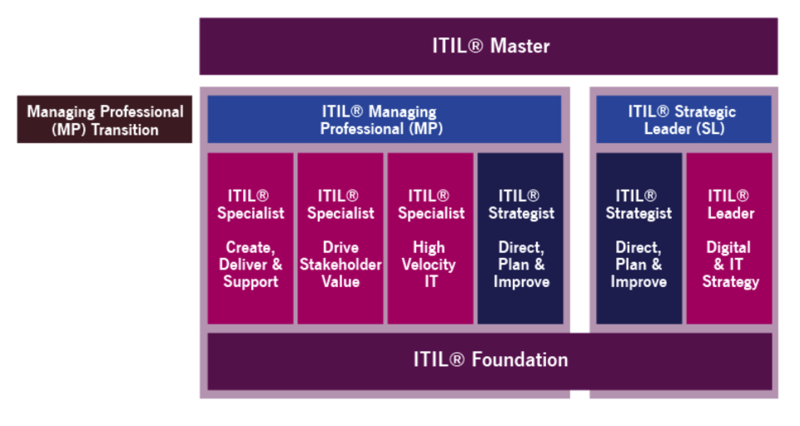 AXELOS has stated that the remainder of the ITIL 4 courses beyond the Foundation level course will be available in late 2019. In the meantime, v3 exams and all v3 courses will continue to be available. To keep abreast of updates, visit the AXELOS website or sign up for Pink’s e-bulletins. When the remainder of the ITIL 4 courses are introduced in late 2019, there will be a “bridging” course available to those individuals who have acquired 17 credits in the ITIL v3 certification scheme. This is one of many reasons why IT professionals are encouraged to continue to participate in the v3 certification programme. Click here to view Pink’s ITIL v3 courses and certification scheme. This is a new two-day course that prepares you for the examination leading to the new Foundation Certificate In IT Service Management. The course is designed as an introduction to ITIL 4 and enables you to understand a new way to look at IT Service Management through a Service Value System (SVS). Bring us onsite to deliver an overview to your entire team. You’ll get a summary of the difference between v3 and ITIL 4, and a summary of key ITIL 4 concepts, including the new Service Value Chain. Contact us at information.asia@pinkelephant.com or +60 3 8605 3610. Bring us onsite to deliver the ITIL 4 Foundation certification course to your entire team. Contact us at information.asia@pinkelephant.com or +60 3 8605 3610. Learn at your own pace from your computer, anywhere at anytime. The FULL ITIL 4 Foundation certification course in e-learning format.